Buying and assembling your skateboard piece by piece is a better than buying a pre-assembled board. Most preassembled boards cost less because you cannot choose what brand of bearings you would like to use. Buying individual parts allows the skater to build a highly customized skateboard to suit their needs. It also allows skaters to have more control over how they want their skateboard to function so that they can take care of necessary repairs on their own while saving time and money in the process. However, assembling a skateboard isn’t as easy as it may sound. It involves finding a deck, trucks, wheels, bearings, hardware, and grip tape that is to your liking as each part holds its own value. A quality deck will not break when executing large drops and gaps, bearings and wheels will help you ride faster and smoother, quality grip tape will help your feet stick to the board, and strong rucks and hardware hold everything together to prevent breakage. are the small metal rings in the wheel that allow the board to spin freely. They also reduce the damage on the axle and the wheels. Technically speaking, there’s metal on inside of the wheels, which results in friction with the axle. However, as the axle is fixed, bearings play a very crucial role in helping the wheel spin. If the bearings aren’t working properly, the friction may become worse. This can lead to the wheels not being able to spin freely which results in damage to both the wheels and the axle. As far as size goes, most bearings come in the industry standard size and will fit all skateboard wheels. This universal size is 22mm for the diameter, with the core and width being 8mm and 7mm respectively. What are ABEC Ratings and Why are They Important? Simply put, an ABEC rating is a measurement of the quality and precision of a skateboard bearing. A higher ABEC rating means that a higher-quality metal was used in the bearings and has a higher level of precision and accuracy. There are 5 different grades that are used to measure the quality and precision of skateboard bearings – 1, 3, 5, 7 and 9, with 9 having the highest level of precision and the best quality of metal. It also means that there will be a lot less friction allows the wheels to spin freely and smoothly. That being said, let’s take a closer look at the exact meaning behind each grade. ABEC 1 bearings are the cheapest bearings that are made with low-quality metal. They lead to a very high level of friction that tends to take a toll on the overall accuracy. These bearings are quite cheap and do not offer much in terms of smoothness and quickness because the wheels cannot roll with undesirably high levels of friction. ABEC 5 bearings are a very balanced option. They are standard quality bearings that are reasonably smooth, fast, and affordable. ABEC 7 bearings tend to come with a high level of speed and smoothness but cost slightly more than ABEC 5 bearings. ABEC 9 bearings are the best quality that you can get for your money’s worth. They are quite expensive but are also the fastest and the smoothest bearings offered on the market. High quality metal is used which means that there will be lot less friction involved. These bearings are considered the best for downhill skating and grinding out tricks that require insane speeds. Beware that there are a few companies that do not follow ABEC ratings. Instead, they have their own customized rating system for various reasons, arguably claiming that ABEC ratings do not take important factors into consideration. 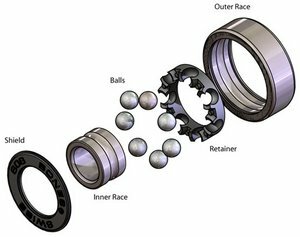 What are the Parts of Skateboard Bearings? While skateboard bearings look small at a glance, they are quite complex and consist of seven different parts. We will be examining all parts and their functions. This information will come in handy while tending to your bearing’s maintenance needs. A small thin ring that keeps the shield in place. As the name suggests, this part acts as the shield of the bearings. It protects it from dirt and other agents. The bearing shield is a ring, too, but larger than the c-ring. This round metal ring is the largest part and casing in which all the other parts fit in. A smaller metal ring that’s placed within the outer ring. It plays a crucial role in the functioning of the bearings as it fits through both the wheels and axles from side to side. Considered to be the most important part of the bearing, it consists of 6 to 7 ceramic or steel balls that allow the casing to roll freely. The ball retainer is another important part that helps the casing roll freely while keeping the individual ball bearings in place. Rubber seals are the rubber exterior of the bearing that protects it from dirt, dust and other damaging agents. Understanding how these parts work helps skateboarders understand more about how their boards function as well as how to deal with problems and repairs. Keep in mind that cleaning these individual parts is also important. It ensures that they function properly, prevent friction, and keeps the wheels spinning. If you’re into street skating, you will need to clean these parts twice as often. Street skating usually leads to an increased risk of bearing damage because of exposure to harmful agents such as dirt and debris. Skateboard bearings come in two different materials. It is important to understand how these materials function so that you can choose the one that is right for your skating needs. Steel bearings are very common and are more popular than ceramic bearings. When it comes to the overall quality including inner balls, sealing, and the quality of steel, things tend to vary from one brand to another. The general assumption is that the best quality skateboard bearings tend to cost the most while the cheaper ones will cost less and may not be made from high-quality materials. This assumption proves to be true since bearings that are higher in price tend to come with better sealing, more inner balls, and a higher quality of materials used in general. Beginner skaters might not notice a major difference between cheap and expensive bearings but most of them can feel it when coming to a sudden stop while performing a trick. Using cheaper bearings may also lead to stiffness over time because they tend to be less resilient to dust and other damage-causing agents. If you’re a serious skateboarder, your best bet is to spend a little more money and invest in higher-quality bearings. Higher quality bearings can stand the test of time and offer the level of precision and accuracy that you are searching for. Ceramic bearings are a relatively new concept and are arguably better than standard skateboard bearings. They offer a better level of smoothness and precision that ensures minimal friction while putting them to use. Ceramic bearings also do not tend expand in the heat and are less prone to any type of damage. On the downside, ceramic bearings tend to cost more than regular bearings. Spending more money on ceramic bearings means that you are investing in better quality bearings that have lower maintenance requirements. There seems to be quite a bit of confusion over whether ceramic bearings are better than standard bearings and worth the higher cost. While there doesn’t seem to be a definite answer, ceramic bearings seem to have the upper hand. The balls are made of ceramic and the other parts are made of steel. The quality of steel used tends to be higher than the metal that is used in regular bearings. The balls in ceramic bearings boast a very strong exterior and contain ceramic powder on the inside. 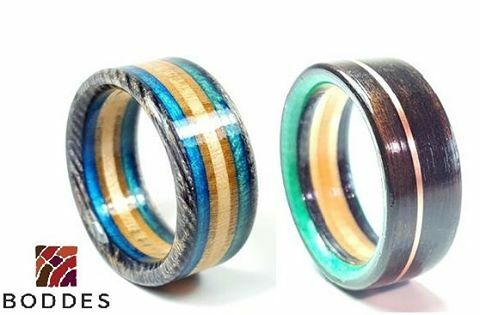 This unique combination helps ceramic bearings become extremely lightweight yet surprisingly strong and durable. There is a minor downside associated with the (stronger) balls that ceramic bearings come with. Once they are damaged, the bearing will stop working completely and you may not be able to repair it. Keep in mind that this is a rare occurrence and something you should not be taking into serious consideration. Another important feature of ceramic bearings is that they come with more balls than steel bearings, which results in better overall performance. There seems to be a surprisingly large number of skaters out there who swear by the level of precision that ceramic bearings offer as well as the amazing low maintenance requirements. Ceramic bearings aren’t prone to rusting and will not need to be replaced as often as steel bearings. Bearing spacers and bearing washers are two important additional options that you may want to consider so that you can assess if they would be a good investment for you. Let’s dive into further detail to examine what they bring to the table. Bearing spacers are equipment that is designed to improve the overall performance of your skateboard and increase the durability of your bearings. Spacers are small metal cylinders that are situated between the bearings that ensure reduced pressure on each bearing and improved smoothness and stability while maneuvering turns. While they are not necessary to own, especially if you’re a casual skater or long boarder, they can be helpful to utilize at times. Bearing spacers are a good choice if you’re looking to perform advanced tricks or skate a lot in general. Bearing spacers are typically very inexpensive as far as pricing goes, regardless of whether they are made of steel, aluminum or another type of metal. When it comes to the sizing, spacers tend to be quite different than bearings. Spacer sizing is completely dependent on the dimensions of your skateboard. The most common size seems to be 8mm x 10mm, with an 8mm axle diameter and a 10mm bearing width. When it comes to the overall spacer width, simply keep in mind that longboards are larger than standard size with a width of 10mm. The common overall width for skateboard bearing spacers is 8mm. What Are Skateboard Speed Washers? As the name suggests, speed washers are used to increase the speed of the wheels on your board. They also help reduce the friction, which translates to more protection for the bearing. Speed washers are also known as “speed rings” and bearing washers. This part is situated between the nut and the bearing where it functions as a buffer. While speed washers are another additional option, they can turn out to be a useful investment if you enjoy skating at high speeds. Keep in mind that they may need to be replaced from time to time depending on the intensity that you skate at and the types of tricks you perform. Replacing speed washers is a simple task. If you see any signs of damage such as rusting or corrosion, you can simply remove the nut and put the speed washer in. Most skaters would need the standard size for their board, which is an 8mm axle diameter. Check out our Abec 7 bearings today for a faster, smoother ride today!